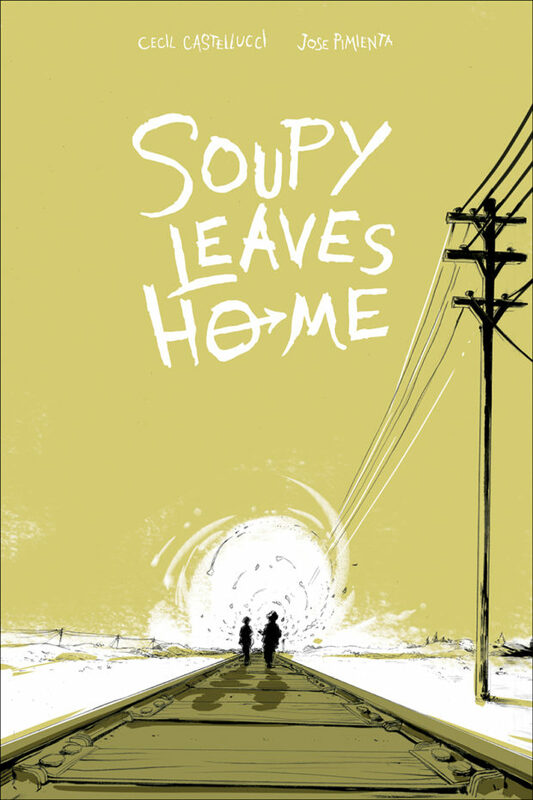 Graphic Novel Review 31/365: Soupy Leaves Home – Dark Horse Week! 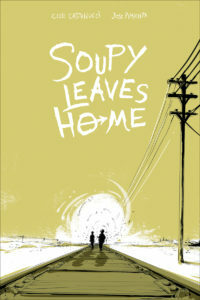 Dark Horse Week continues with Cecil Castellucci and Jose Pimienta’s Soupy Leaves Home. Set in the early 20th century, Soupy Leaves Home is the tale of a teenage girl that runs away from from an abusive home. Posing as a boy, Soupy (as she quickly gets nicknamed) joins a hobo named Ramshackle on the road to adventure. As they travel across the country, Soupy and Ramshackle develop a friendship of convenience and loyalty as they deal with other homeless travelers and the troubles of being on the road. I did find myself caring about the characters in the book because while bits of the backstory are there, this 200 page book primarily focuses on the development of Soupy and Ramshackle. Expertly designed color strategies shed light on this story as no other book that I’ve yet reviewed has; the coloring is almost another character in this graphic novel. Mainly created in monochromatic color schemes, the book uses splashes of mixed color beautifully to enhance character development or emotion. In a Christmas present exchange between Soupy and Ramshackle, simple gifts of appreciation explode through the monochromatic color scheme and erupt into multicolored Christmas trees and a vast assortment of food and drink. It’s emotionally powerful and simply captures the true spirit of the holiday season that these two are sharing. The fact that this book is not littered with backstory is a plus. Because we spend most of our time with these two, we care for them, and because of that, the last act of the book is powerful and emotive. While I will not spoil how things end for these two, I will say that I was satisfied by the ending. The pacing of the work is extraordinary, and Castellucci and Pimienta should be very proud of this graphic novel. I will be getting some copies of this book for my graphic novel class. I will give it to the kids that want to get into how color affects story. There is a lot more to discuss with this story as far as character, plot, and setting, but I will save this one for some kids to dive into the analysis of color, which now that I look at it again, is very similar to Josh Neufeld’s A.D. New Orleans After the Deluge…no real connection there, just interesting, and possibly worth a mention if you end up teaching both.